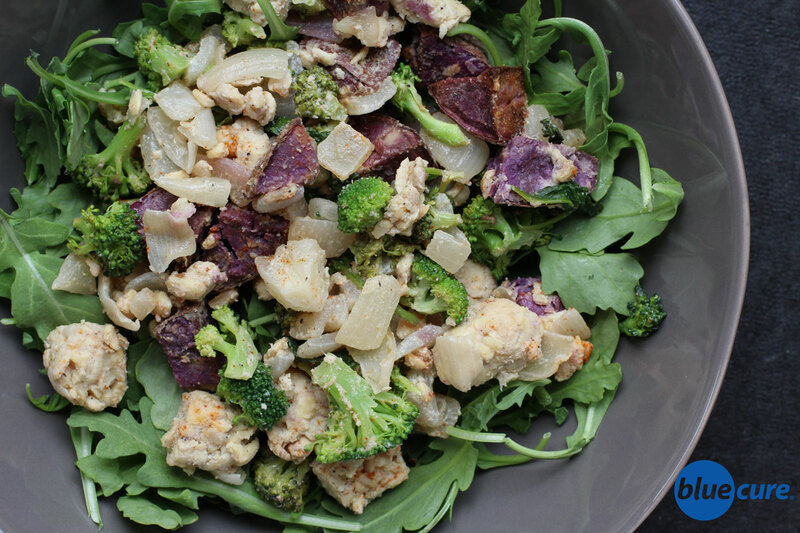 This purple sweet potato dish is savory and delicious! It combines lemon, garlic, and tahini with black pepper and miso to give its savory taste and creamy texture. The sweet potatoes add a touch of sweetness and the tempeh give its a bit of a nutty flavor. Enjoy it warm or serve it chilled. This meal is a light fare, but it’s packed with both fiber and plant-based protein. To bulk it up more, serve with cooked quinoa, add roasted chickpeas, or toss in pumpkin seeds. *Swap in orange sweet potatoes if you can’t find purple. Wash and chop the veggies. Preheat the oven to 450F. Line a pan with parchment paper or a silicon mat. Place the potatoes on the pan. Roast the sweet potatoes for 30 minutes or until tender. Cube the tempeh. In a pan, combine the tempeh and ¼ cup water. Simmer on medium heat until the water steams off. Stir the tempeh often. 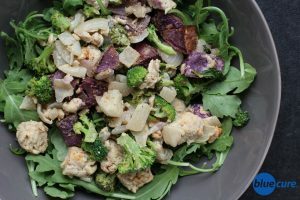 Add the chopped onion and broccoli to the pan with the tempeh. Add 1-2 Tablespoons of water, as needed to keep the veggies from sticking. Cook until the veggies reach desired texture. In a bowl, combine 1/4 cup of water with garlic, tahini, miso paste, black pepper, and lemon juice. Stir until well combined. Pour the sauce over the veggies. Add the greens and let them wilt down.